I'm excited to finally be able to publish a very early preview of our next major feature - Autotagging Rules. WARNING: THIS IS A VERY EARLY PREVIEW and the main purpose of it is to collect user feedback on the new feature. It is possibly VERY BUGGY!! Don't use it with your actual notes! or even moved to another section) automatically. Can I activate and deactivate a rule at will? Yes. Each rule has an "active" flag which you can set. When this flag is not set, the rule is skipped during rule application process. When exactly are the rules applied? 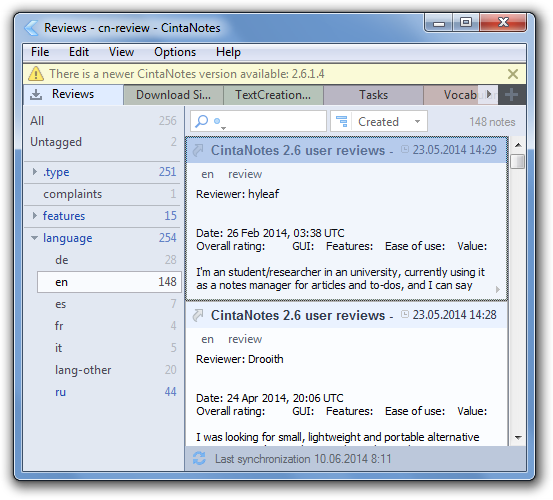 A new or modified rule is automatically applied to all existing notes upon closing the Rules window. After that, each time any note changes in any way, all active rules are re-applied to it. For new notes, rules are applied upon first save. Is there a way to test the rule before activating it? Yes. Rule editing window has the "Test Rule" button. After pressing it, the rule is tested against all notes in the notebook and CintaNotes will report to you how many times the rule actions would be executed. Why there are no conditions on created and modified dates? They are planned but not implemented yet. Will be added in Beta 2. Are rule conditions equally fast? No. For example, "contains" condition is much slower than "starts with" or "ends with" conditions. Conditions with "any text field" are slower than conditions for specific fields. other conditions reduce the number of analyzed notes. Hope you enjoy this beta, and as always, huge thanks for your help and advice! Please share what you think about the new feature, do you have any problems with it, etc. Thanks! New "Notebook" top level menu Moved there items related to currently active notebook from "File"
Hi Ovg! Thanks for the reports. I've fixed both issues, please re-download using same links. Thanks, It is working fine for me! Great feature, I can think of a myriad of uses!! Will there be an indication to what rules have been applied to avoid confusion when for example trying to remove a tag that is automatically assigned again because of a rule? Negative stuff like 'has no tags' will give 'Operator 'isempty' not supported', also Attachments rules won't give an error but won't work either. The last 2 only happen on Windows XP. I exported all the notes and imported them in a new .db, and ALL THOSE ISSUES WERE SUDDENLY GONE! Saved a whole lot of disk space too, about 10% of the .db. I wonder if I should do the same with my regular copy of CN, haven't had any issues with it as of yet (still on 3.1.2 btw.) While I copied exactly the same .db to use with this beta. date wrote: Great feature, I can think of a myriad of uses!! I'd like to add it, but I'm still not sure what this indication should look like. Maybe you have some ideas? I confirm the problem with tags, but can't reproduce it with attachments. Could you tell me the exact rule setting that you have for attachments? Wow that's quite a number! For how long did you wait? Does 3.1.2 work fine with that? Can't reproduce either of those issues. Can be that your .db file was slightly corrupt and you fixed it by re-importing notes into another file. So it actually might be a good idea to do the same with your main db copy. But if you have your notes SN-synced, it's better to allow CN to download notes from Simplenote into a new DB instead of importing. When you create a rule that adds some tag as its "THEN" action and removes it as its "ELSE" action, this tag essentially becomes a predefined search. Create a rule with either empty condition (or, after Beta 2, "tags - is empty" condition), and add a single tag assign action. For example, you want to make "site" and "blog" synonyms of tag "website". Create a rule "IF [Tags have any of 'site blog'] THEN [Remove tag(s) 'site blog'] AND [Add tags 'website']. 4) Logical expressions for tag search, like "tag1 AND NOT (tag2 OR tag3)"
This one doesn't work yet, but it in Beta 2 it will be possible to add conditions on Created and Modified dates. If attachments is not empty, then, apply tag 'has_att', else, apply tag 'no_att'. After processing the rule, the has_att tag has 37 notes, the no_att has 205 notes. I can safely say 15 minutes. But, as with the other two issues, this one disappeared too after exporting and importing. Now it only takes less than 5 seconds. I tried on my currently employed 3.1.2b2 copy, NOT having exported and imported, (SAME .db), and renamed the same tag manually (as dragging came in 3.1.3)...: took 2 seconds. Auto tagging is a nice feature indeed! Thank you! It is possible to have more complex rules? The rules-editor looks somewhat lost, when you open it for the first time. Maybe you want to add some rules as suggestions, which are deactivated by default. The dialog is modal, which prevents me from checking notes. However, when i create a rule, i might want to read my notes to better understand on how to create a rule. Add a confirmation dialog, when closing the rule editor. For example "Apply rules now?". Executing rules can have a huge impact. Especially as there is no undo. I need to remember myself to create a backup, before applying rules. Allow me to save rules without applying them immediately. Instead add a button "Apply rules" inside the rule editor. Another request is to add a button "create backup now" inside the rule editor or add a confirmation-dialog "create backup", when i click "OK". Maybe add a checkbox "[X] create backup before applying rules". Add a menu item "Notebook\Apply rules". I tried to simulate the exclusive tag feature, which is on the roadmap, but failed to do so. The reason is, that an "on-event" action is not possible. For example, on adding tag "tasks/completed" remove any other tag "tasks/*". Of course there is another issue with this. Right now rules are executed on saving a note only, what i am asking for is an event driven management of rules inside the editor. An option might be to have a shortcut, that triggers rules execution. That way i could assign a tag "Delphi", which then would assign the section to "Development" by applying the rule. In other words applying rules on saving a note might be to late, as i want to check the results before saving a note. Add an option to apply rules to new notes only. For example "if Any text field contains "Delphi" add tag "Delphi" and move to section "Development". That would allow for changing the section to something different after saving the note the very first time. Now we have rule execution when confirming the rules editor dialog (acting on the entire notebook) and when saving notes (acting on the active note only). I also understand that first time i save a new note, rules are applied. Thereafter mode changes to editing while i keep on editing the note inside the editor. Maybe a "on delete note" is of interest. One could add a rule to move a note to a section "archive", rather than deleting it to recycle-bin. Even when the user presses "Ctrl+Del". Applying rules on notes that haven't changed can give unexpected results. For example i had added a rule "if tags "have all of" "Delphi" move to section "Development". That would have changes 108 notes. However, only 92 were correct. The other 16 notes were located in other sections, which i don't want to change!!! In other words doing global assignment is dangerous. When opening notes in the editor it sometimes happens, that the note changes without having me actually editing it. This is related due to bugs we have seen in the past. In such cases, i don't want the rule-tags to be executred. They should run only, when the user actively modified the note. off topic: Please include the settings-file for creating a backup of the database. This is especially important when running tests. I am ware, this is quite a list. It took me some time for testing and writing down the issues. It might not have the quality of my earlier posts. Feel welcome to ask on issues which are unclear. This is a good idea, but it needs to be developed further IMO. Of course there's no need to show it for every changed note (especially if a ton of them changed at once by moving to another section or renaming a tag). I think the main point here is to tell the user that some rules have just been applied. The extra info about the applied rules would be nice but not that crucial. In this case, an auto-hiding notification would be ok (something like a "toast" notification on Android). The tags were applied already when you closed the rules dialog, not upon moving the notes. So it's crucial which section you had selected when you were looking at the tag counts. Ok, please let me know if something like this happens again. Thanks! Ovg wrote: Auto tagging is a nice feature indeed! Thank you! Look in the list of operators - negative operators are there as well. Or did you mean something else? Ok, thanks for the answer! It will be great if you could add this in future! thanks a lot for taking a look at the new feature and spending time testing it! Good idea. The problem is, what rules should that be? Do you think that the "has remarks /attachments" rules are good candidates here? Actually I have an idea that in future versions CN could analyze existing notes and suggest to create rules if it sees very strong correlations between certain tags (sections) and note components (e.g. the site domain in the Link field). I guess the dialog with the rules list can be made non-modal without any problems. Will fix that, thanks. I'm not exactly sure that creating extra backups is the right way to go. This is inconsistent: when notes are added or changed, rules are applied as well, but no backups will be created. Also, creating so many backups can quickly fill up some SSDs. But I agree that it's better to be on the safe side here. So I think I'll add an on-by-default checkbox to create backup to the "Rules changed - apply to existing notes?" confirmation box we discussed earlier. So one menu will have both "Rules" and "Apply rules"? Seems a bit redundant to me..
Not sure I understand which feature you're talking about, could you please post a link to the roadmap issue? Applying rules in event-driven way is an interesting idea, but I'm afraid too complex to implement well. It can easily drive you mad if note section will change or some additional tags will start to appear as you are editing a note. I don't quite understand why you don't want to press Ctrl+S to see the rules applied? If you have a designated section for new notes, this is already possible - you can add "Section = 'MyInbox'" condition to the rule. (Or you can use the note's Untagged status for this). Also there's a problem with correctly defining what is a new note. Say CN downloads a note from Simplenote - is it a new note or not? Now we have rule execution when confirming the rules editor dialog (acting on the entire notebook) and when saving notes (acting on the active note only). I also understand that first time i save a new note, rules are applied. Yes. The only exception - if you have "After Clipping / Open in editor" option set, the rules are applied to the note even before the new note is saved. Thereafter mode changes to editing while i keep on editing the note inside the editor. Maybe a "on delete note" is of interest. One could add a rule to move a note to a section "archive", rather than deleting it to recycle-bin. Even when the user presses "Ctrl+Del". Deleting a note can be viewed as a way of modifying it, so I don't see why this couldn't be implemented. However frankly I'm doubtful of the usefulness of such rules. By creating such a rule, you're effectively saying to CN: "I want all notes with the tag 'Delphi' to be always located in the 'Development' section". And it does what you tell it to do. If you want only _some_ of the notes to be analyzed, you need to say it: "If section is "UnsortedNotes" and tags have all of 'delphi'..."
When opening notes in the editor it sometimes happens, that the note changes without having me actually editing it. This is related due to bugs we have seen in the past. In such cases, i don't want the rule-tags to be executed. They should run only, when the user actively modified the note. Agreed, I'll see to it that the rules are only run when note is changed in such a way that it's modified date changes. Sorry, don't quite get what you mean here. The backup settings are per-notebook, and are stored in the notebook, not settings file. Huge thanks for this list, Thomas, it will definitely help to make the feature more user-friendly and production-ready! I see it as follows: this feature, if implemented well, can become the killer feature of CN (and will allow us to make SN sync and attachments free). But implemented poorly, it will ruin everything. I moved the notes first to examine what went wrong. The no_att tag had notes which certainly had attachments. I tried to isolate further, but found that my database which I exported and then imported didn't have this problem!! Ovg wrote: Ok, thanks for the answer! It will be great if you could add this in future! replace "contains" operator with "contains all of" and "contains any of" operators. Would this be a good solution, what do you think? Very cool! I can see various uses for this and the potential for new features.